Looking for something sweet AND healthy? 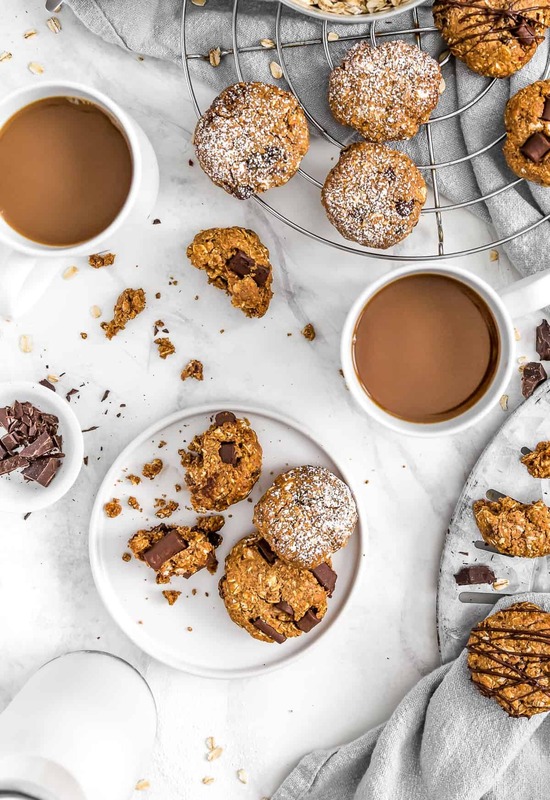 Let us introduce you to these beautiful goodies, Old Fashioned Oatmeal Raisin Cookies with chocolate chips. 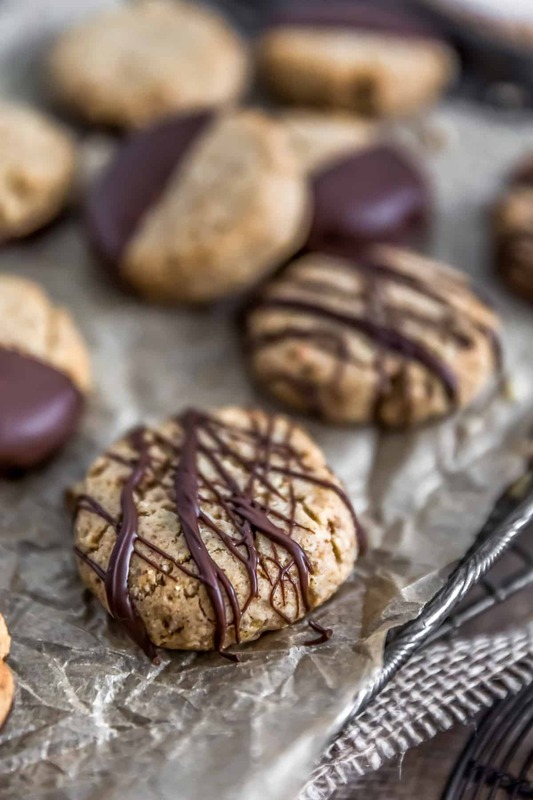 Perfectly healthy and delicious, these amazingly chewy and delightfully soft cookies are easy to make; plus, they are the perfect after school treat for the kids or after a long day at work for the bigger “kids.” One bite and your sweet tooth will be sated! Whole Food Plant Based, no oil, no refined sugar, no highly processed ingredients and gluten free. I am in love! There is nothing better than a soft, thick, chewy cookie! 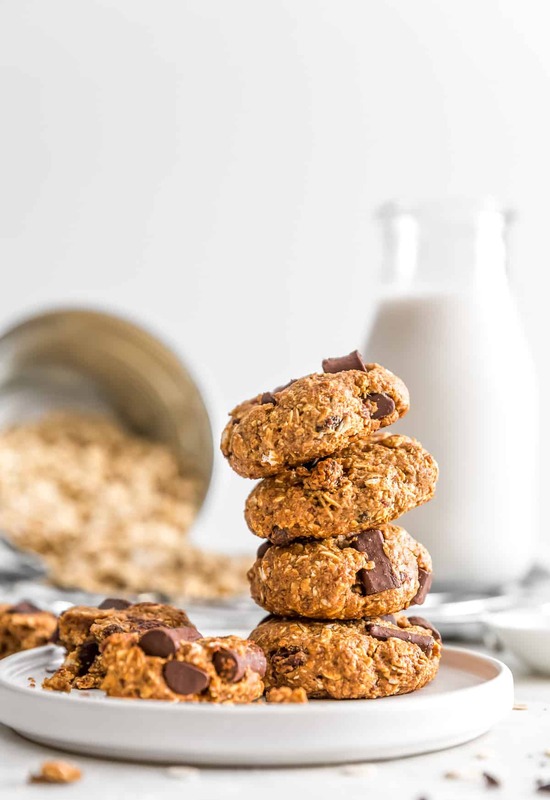 Don’t get me wrong, I love me a thin and crispy cookie too, but when it comes to oatmeal cookies, I enjoy the classic soft and chewy ones every day of the week! Medjool dates are used to sweeten these lovelies. They work in perfect harmony with the other ingredients in this recipe. If you are not a fan of raisins, just leave them out. If you are concerned about adding chocolate chips, just leave those out. No matter how you make them, they are just so gosh-darn delicious! The cookie batter is especially sticky, so we hand rolled each cookie, creating a nice golf-sized shaped ball. Then we washed our hands, and with slightly damped hands, we took each cookie ball and rolled them again to make a very smooth, tightly rolled ball. Then after we double-rolled each cookie, we slightly flattened them into a disk and used the side of our palms to keep the cookie edges smooth and symmetrical. The extra care taken really creates a nice cookie. 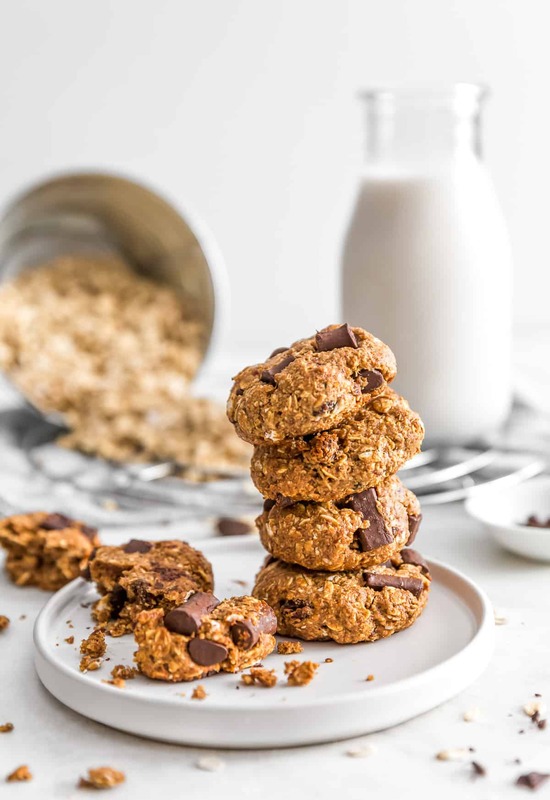 Of course, you wouldn’t do this with normal oatmeal cookies; however, since we are not using any oil, shortening or traditional butters, the cookie needs a little extra tender loving care to ensure that it holds together and bakes nicely. Trust me, it is totally worth the effort. The “powdered sugar” on these cookies is not your run-of-the-mill traditional powdered sugar. It is made by placing dried date sugar with organic, non-GMO, gluten-free cornstarch in a high-speed blender to create a perfectly Whole Food Plant Based compliant “powdered sugar.” Yeeee hawwww! Honestly, the only reason we did this was simply to make a pretty picture. 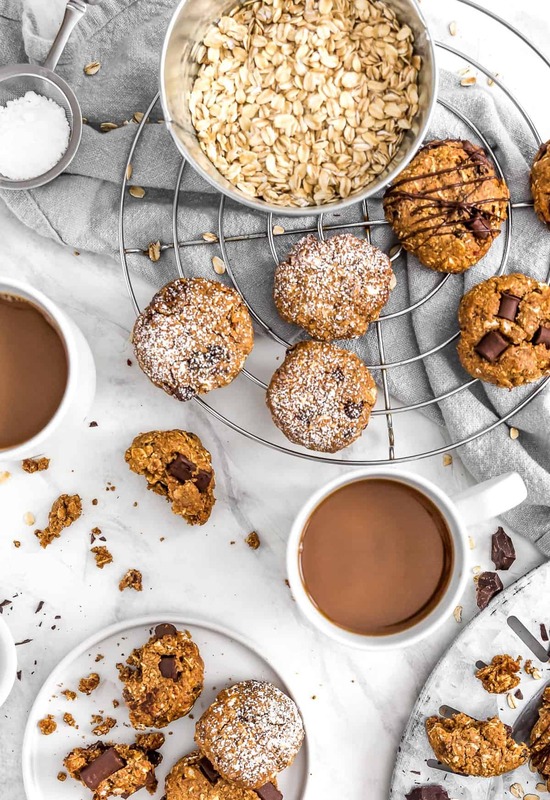 You don’t have to do this, although, I must add my dad loved the oatmeal cookies with the “powdered sugar.” He said it made it feel like he was eating a normal oatmeal cookie. 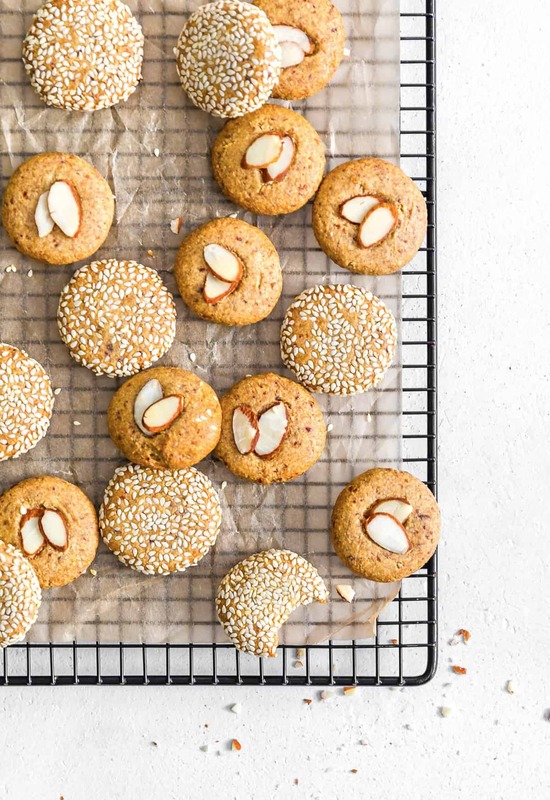 We hope you give these super tasty cookies a try! If you love old fashioned oatmeal cookies, then I just know you are going to love these! Looking for something sweet AND healthy? Let us introduce you to these beautiful goodies, Old Fashioned Oatmeal Raisin Cookies. Perfectly healthy and delicious, these amazingly chewy and delightfully soft cookies are easy to make; plus, they are the perfect after school treat for the kids or after a long day at work for the bigger “kids.” One bite and your sweet tooth will be sated! 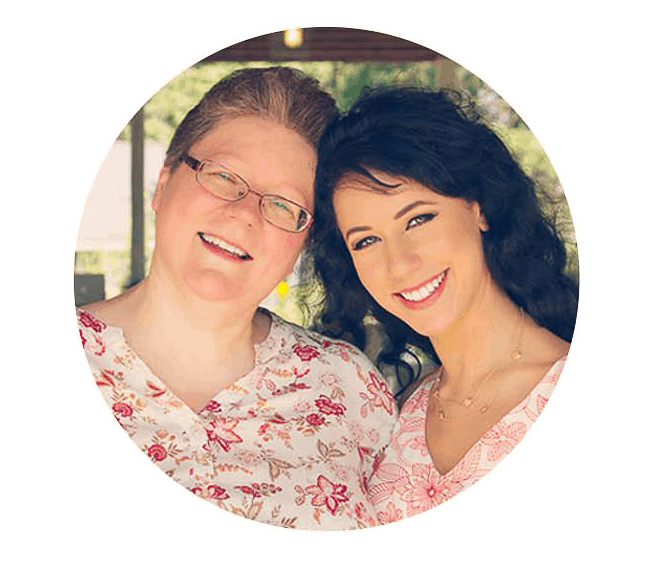 Whole Food Plant Based, no oil, no refined sugar, no highly processed ingredients and gluten free. Line 2 baking sheets with parchment paper or with silicone baking mats. Set aside. Place 1 cup of the rolled oats into a food processor and pulse until finely broken up, but do not turn the rolled oats into flour. Place the processed oats into a large mixing bowl. Next, add the other cup of rolled oats (not processed) into the same large mixing bowl as well. To recap, you have 1 cup of finely processed/pulsed rolled oats, and 1 cup of rolled oats now in a large mixing bowl. Then to the large mixing bowl with the oats, add the cinnamon, sea salt, baking powder, baking soda and almond flour. Mix until combined. Now that the food processor has been emptied, add the 9 pitted Medjool dates to the food processor. Note: Medjool dates are very soft, if not using Medjool dates, you will need to soak the dates in hot water for 30 minutes, then discard the water and add the softened dates to the food processor. Then add the following ingredients to the food processor along with the pitted Medjool dates: Almond butter, applesauce, molasses, and vanilla. Pulse until the dates are broken down and everything is mixed well. Add the date mixture to the large bowl with the oat mixture. Mix well until everything is well combined. The mixture will be a little challenging to stir and very sticky. Then add the raisins and chocolate chips; mix until combined. At this point, the mixture is very hard to stir and very sticky. Take a golf balled-sized piece of cookie dough and roll it in your hands to form a ball, then place the ball onto the parchment paper/silicone mat lined cookie sheet. Continue until you have rolled all the dough into balls, and placed the dough balls on the baking sheets. See notes for 2nd round of rolling. After the 2nd round of cookie ball rolling, now slightly flattened each ball to form a thick disk. Firm up the edges to keep a cohesive well-formed disk. The cookies do not spread much while baking, nor do they flatten further. The shape you create will be your cookie size and shape. We like a thick chewy cookie. Our cookies were 2 inches in diameter and ¾ inches thick. Place the cookie sheets into a preheated 350 F oven and bake for 15 minutes, rotating the cookie sheets from bottom to top racks and vice-versa half-way through if using two cookie sheets.If using one cookie sheet, just use the center rack and there is no need to move the cookies around the oven. After 15 minutes, remove the cookies from the oven and immediately place onto a wire cooling rack for 10 minutes. Removing the baked cookies from the cookie sheets prevents the bottoms from over-browning. Allowing the cookies to rest for 10 minutes allows the cookies to firm up in texture. Melted Chocolate Drizzle - Optional: Melt ¼ cup of chocolate chips in the microwave for 20 seconds, stirring constantly after removing from the microwave until the chocolate has been completely melted. If you need the chocolate melted more, then place back in the microwave in 5 second intervals. Then drizzle over the completely cooled cookies. 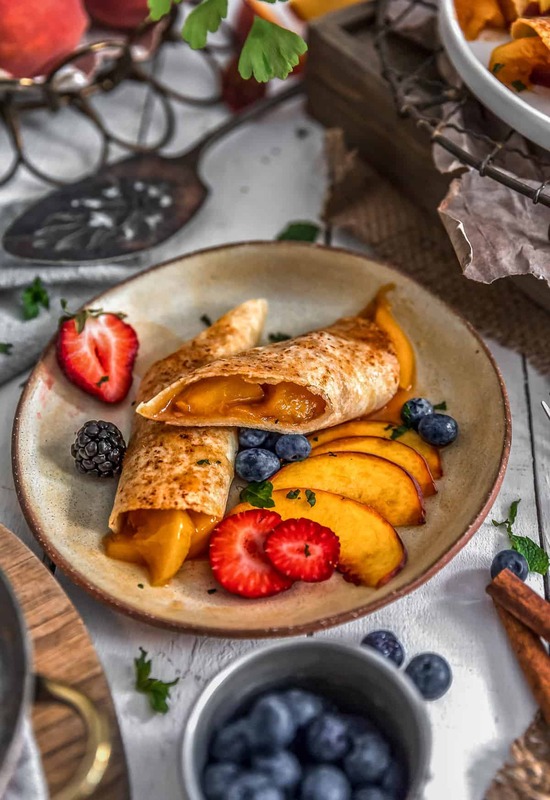 “Powdered Sugar” - Optional: Place 1 Tablespoon of dried date (or maple) sugar and 1 Tablespoon of cornstarch into a high-speed blender (Ninja) and blend on high for one minute to create a very fine powder. Sprinkle the date “powdered sugar” over top of completely cooled cookies through a fine mesh sieve. See notes. *Cookie Dough Tips for Success: The cookie dough is sticky, but it should form a ball easily. Tip: The more round and smooth you make the cookie ball, the better cookie texture results. 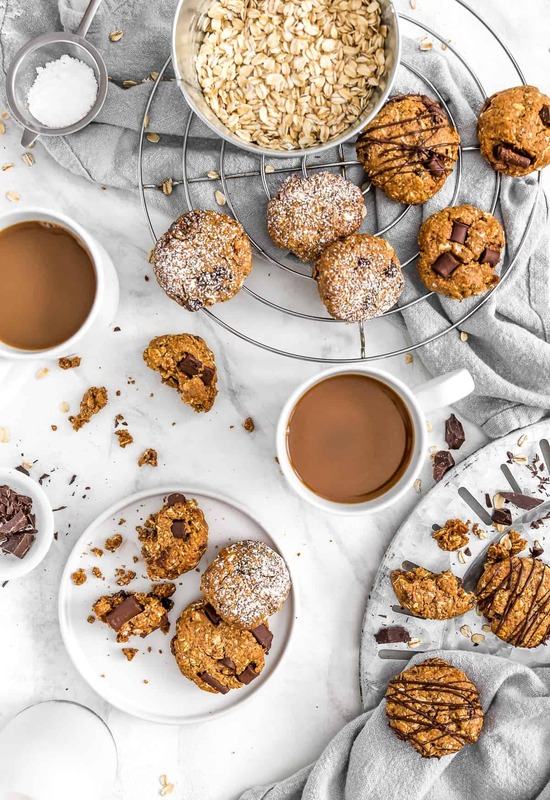 What we have found works well and creates a great cookie is the following: We create all the cookie balls, washing our hands between every 5 to 6 balls until we have created all the cookie balls. Then we wash our hands again and with slightly dampened hands, pick up each cookie ball and roll it again in our hands to create a very smooth round ball. The 2nd round of rolling is not required, but it does make a really nice cookie shape. Then slightly flatten each ball to form a thick disk, understanding that the shape that you just formed will be the cookie size and shape that comes out of the oven. *“Powdered Sugar”: To create Whole Food Plant Based compliant “powdered sugar” you may need a smaller high-speed blender like a Ninja. We are not sure if a larger high-speed blender (like a KitchenAid) can turn such a small amount of product into powder since the mixture could fall underneath the blades. These look sooo good. I’m dying to try them! These are by far the best whole food plant based cookies I have ever had. I have stayed away from dessert that are wfpb because quite hosnestly they are often quite terrible. I am so happy I I decided to give these a try. Love love love them! Thank you for giving hope in being able to wfpb baked goods again ?